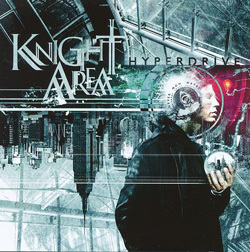 Originally founded in 2004 by keyboard player Gerben Klazinga, the curiously-named Knight Area have already clocked up four studio albums, a live offering and an EP in the past ten years, although, to my mind at least, with their newest release ‘Hyperdrive’ the band have really hit their stride. The catalyst may be the arrival of guitarist Mark Bogert and bassist Peter Vink, both of whom made their debut on 2013’s ‘Between Two Steps’ EP and both of whom contribute to the band’s presence and to the songwriting. The Dutch five-piece are already masters in the progressive metal scene, and ‘Hyperdrive’ will do their reputation no harm at all. From the catchy opener ‘Afraid Of The Dark’ to the expansive and exciting set closer ‘Hypnotised’ via the lively and effervescent ‘Bubble’ (which pretty much covers all the bases as far as progressive metal is concerned, and is bolstered by a cracking solo from Klazinga) ‘Hyperdrive’ is a seductive and beguiling album which purrs and plays like a kitten and oozes class from track to track. Knight Area have a more melodic take on the genre, with beautifully overlaid vocals and accessible compositions – no matter how many twists and turns they make – that stay in your head for days. The virtuosity of the musicians is evident throughout, but never at the expense of the songs: so whereas Bogert’s solo in ‘This Day’ is pretty much a masterclass in itself, it supports rather than dominates the track. In long-term vocalist Mark Smit the band possess a not-so-secret weapon, his voice being the perfect foil for the band behind him, and behind the kit Pieter van Hoorn (who’s also been there from almost day one) keeps a watchful eye on things but also stretches out when the mood takes him.